The Recycle Depot no longer accepts alkaline batteries. These are not hazardous when placed in regular trash and landfilled. Do not burn or bury—dispose of alkalines with your commercial trash hauler. The Depot takes ALL other types and sizes of batteries: automotive, rechargeable, dry cell, nickel-cadmium, lithium ion, button-cell, lead acid, etc. Rechargeable batteries can be used several times and are relatively inexpensive, but they do eventually wear out. These batteries will lose their charge over time, so do not use them in low-use appliances, such as smoke detectors. Good uses include flashlights, radios, photo flashes, and handheld games. Nickel-Cadmium rechargeable batteries (Ni-Cads) contain Cadmium, a metal toxic even in small quantities. These batteries are commonly used in portable electronics. In typical use, many portable electronics are only used for a short time before they are put back in their cradle for recharging. If the battery is only discharged slightly, it is being trained to only work for a short period and it will eventually loose most of its capacity: this is called the memory effect. To avoid the memory effect, and prolong the life of your battery many times, make sure to run it down once in awhile. Nickel-Cadmium batteries should not be disposed of with the normal trash. 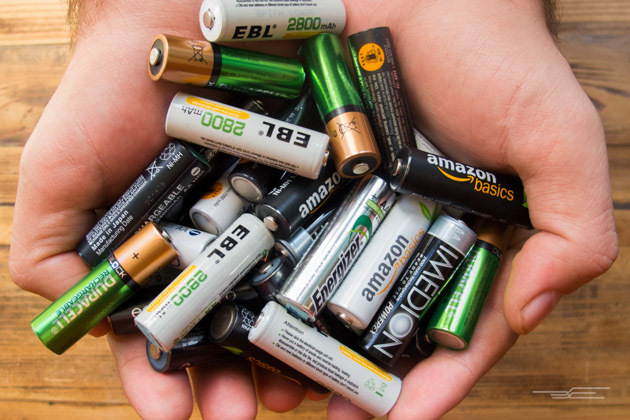 While using rechargeable batteries is better overall for the environment than disposables, the metals should not end up in landfills when these batteries die. The new rechargeable alkaline batteries have the advantage that they contain no cadmium, which is a drawback to nickel-cadmium rechargeables. All rechargeable batteries can be recycled with your household batteries.